Natalie grew up around music, raised in a household that revolved around tunes and harmonies. 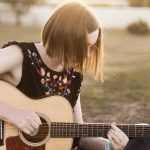 She began playing the guitar at a young age, taking any opportunity to perform, including at church services. Natalie was able to turn her passion for music into a career and now spends most of her time bonding with others over their love of all kinds of music. As a worship leader, you may find yourself facing a new challenge – trying to reach an audience that is getting younger by the day. While millennial's are currently the largest population in the US, they will soon be joined by Generation Z. This means that, as a leader, you need to find a way to reach these specific age demographics.